The market is underestimating the likely positive developments of JCI’s spinoff of its automotive interiors division. 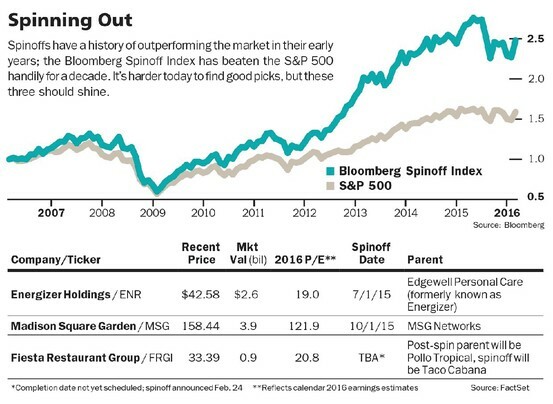 Investing in spinoffs has become a crowded trade, but Energizer and MSG are still attractive. Much like the little-known gem of a restaurant that loses some of its luster when the masses swoop in, spinoffs often lose their cachet when too many investors chase too many of them. But true foodies—and savvy investors—always know where to look for the next great find. Since 1999, newly liberated companies outperformed the Standard & Poor’s 500 index by six percentage points in the first two years after they were spun off, according to Goldman Sachs. And over the past five years, the Bloomberg Spinoff Index has returned 103%, compared with 55% for the S&P 500. The index tracks, for three years, companies that launch with a market value of at least $1 billion. Studies have attributed the superior performance of spinoffs to factors including investors’ greater appreciation of a business after it is no longer ensconced within a larger entity, plus the new company’s ability to be run more efficiently, get more dedicated resources, and more effectively incentivize management. Enter the hordes. In 2014 and 2015, spinoffs surged, with 100 new companies launched, often as a result of pressure from activist investors. Spinoffs concocted under duress have a mixed—and occasionally horrible—track record. Shares of specialty-chemical firm Chemours (ticker: CC) are down 56% since DuPont (DD) spun it off last summer at the urging of Nelson Peltz’s Trian Fund Management. “You don’t get the same quality of spinoffs as you do if management and the board have come to that decision without pressure,” says Ivy Mid Cap Growth fund’s manager Kim Scott, who often looks at spinoffs for potential investments. That decline in quality is borne out in recent returns. Over the past year, as the S&P 500 has fallen 0.6%, the Bloomberg Spinoff Index has slid 6%. The 42-stock Guggenheim Spin-Off exchange-traded fund (CSD) has fared even worse, down 17%. Clearly, this isn’t a market for simple index investing. Instead, investors must be choosy about picking the right type of spinoff, and at the right time. In the past, companies spun off unprofitable or marginally profitable businesses that investors essentially valued at nothing. It would take a few years to get a spinoff’s profitability up to the industry level once it was on its own. But as that happened, it would drive the stock higher, says Murray Stahl, chief investment officer of Horizon Kinetics. “You don’t see as many spinoffs like that now,” he observes. “You’ll have to wait for a recession, when companies lose customers, are saddled with debt, and profitability declines” to find a better crop to invest in. With 2016 on track to be a lean year for spinoffs, timing becomes even more important. There have been just nine so far, putting the year on pace for 27, down from last year’s 40, according to Joe Cornell, founding principal of the advisory firm that publishes Spin-Off Research. Spinoff stocks might trade higher in the when-issued market—a few days before the shares are distributed—often making them overvalued when they come out. In that case, be patient and wait for them to come back down. ENERGIZER HOLDINGS (ENR) embodies traits that have typically led to outperformance by spinoffs. Energizer spun off its steady cash-generating battery business last July, giving the spinoff its old name. The parent entity retained its faster-growing businesses—including its Schick, Playtex, and Hawaiian Tropic brands—and renamed itself Edgewell Personal Care (EPC). Energizer’s shares have risen 25% since then, but Gabelli Asset fund manager Kevin Dreyer sees about 15% more upside. Dreyer expects margins to improve due to a shift in the competitive landscape. Berkshire Hathaway purchased rival Duracell in 2014. Under Procter & Gamble’s ownership, Duracell was often promotional, but Dreyer expects the new owners to run the business with an eye toward maximizing cash flow, which should mean fewer price wars. Analysts expect Energizer to earn $135 million, or $2.17 a share, this year, on sales of $1.6 billion. Now that Madison Square Garden (MSG) is free from MSG Networks (MSGN), it can use the $1.6 billion on its balance sheet to grow via acquisitions or buy back shares. It could also monetize the air rights above its midtown Manhattan arena. In the interim, the company, which became independent in October, has stable and modestly growing cash flow from the sale of TV rights. Analysts expect net income of $28 million, or $1.13 a share, on $1.1 billion in revenue for the fiscal year that ends in June, with a 3% increase in profits on a 7.5% sales rise next year. The company could also be an attractive takeover target, says Cornell, who thinks the stock could rise 30%, to $210 from its current $160. THE CLASSIC WAY to benefit from a spinoff, of course, is to buy shares of its parent company before the deal is done. Cornell suggests Fiesta Restaurant Group (FRGI), which plans to split off its slower-growing, but cash-generating, fast-casual restaurant Taco Cabana. Fiesta will change its name to Pollo Tropical, the faster-growing Caribbean chicken chain it will retain—a cult hit in South Florida that is expanding elsewhere. A date for the spinoff has not yet been announced.